Sunny. High near 85F. Winds NW at 10 to 15 mph..
Boat captain Robert Bingle, left, operated his Triton 21XS Elite bass boat on Stillhouse Hollow on Jan. 27 for anglers Tara Reid, middle, and Cameron Clouse of the All Around Anglers youth bass fishing club. The team finished second and landed the event’s largest fish, a 6.01-pound largemouth bass. Jordan Grimm, left, and Joseph Garland fished consistently over a span of two days on two different lakes — and during a wild swing in weather — to land the heaviest 10-fish limit out of a 59-team field. They took home the TuffMan championship and a $10,000 check to go with it. 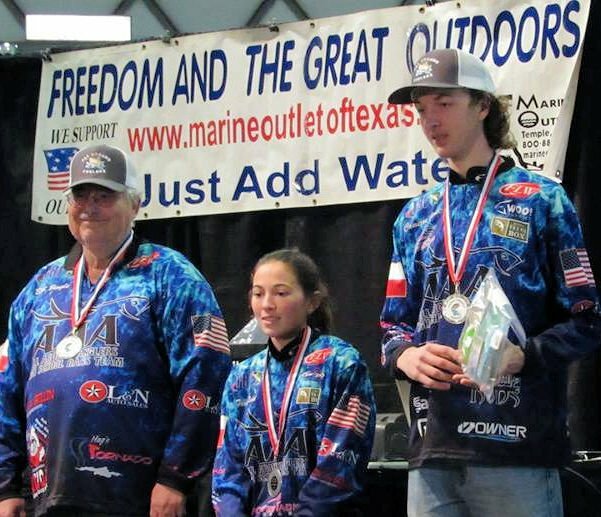 With the 2018 Central Texas Boat Show as a backdrop, anglers from two very different tournament series walked across, and weighed their fish on, the same stage last weekend at the Bell County Expo Center. The TuffMan series held its championship event Jan. 27-28, fishing the first day on Belton Lake and the second day on Stillhouse Hollow Reservoir. The combined total weight from the two days’ efforts would determine the victorious team. On the first day of the tournament, 59 teams qualified through their efforts in the several tournaments which preceded the championship round. The first half of this day on Belton was what many anglers hope for in the winter months — a cloudy and balmy day with a bit of breeze at the end of a string of steadily warming days, and with a cold front moving in. Those conditions lasted until around 11 a.m., when the mild, Pacific cold front arrived, causing the wind to shift to the north and the temperature to level off. Three two-man teams rose to the top at the close of the first day — Charles Reagan and Byron Albrecht took the lead, Jordan Grimm and Joseph Garland stood in second place, and Jason Dildine and William Lynch held third place. In all, the 59 teams brought 198 fish to the scales. Fishing on Stillhouse was, by all accounts, tougher. The cold front dropped air and water surface temperatures, and the clearing skies brightened as the tournament progressed. Nineteen teams failed to weigh in a single fish, and only 129 fish were brought to the scales. At the 2:30 p.m. weigh-in Sunday, none of the top three teams from the previous day’s efforts appeared in the top three billets. Thomas Martens and Dean Alexander had the heaviest sack with 27.48 pounds of fish, followed by Dean Golmon and Jayson Kisselburg with 21.50 pounds, and Bobby Babcock and Thomas Wells with 21.48 pounds. When all the tabulations were completed and the results from the two days’ efforts were combined, Sunday’s fourth-place team, Jordan Grimm and Joseph Garland, prevailed over the rest of the pack. They weighed in five fish on Belton and Stillhouse weighing 18.21 pounds and 18.99 pounds, respectively, for a grand total of 37.20 pounds. Thomas Martens and Dean Alexander finished in second place with a total weight of 36.64 pounds, and Bobby Babcock and Thomas Wells finished third with a total weight of 35.31 pounds. Once the wind picked up and the fog lifted, they attacked windy, main lake points with an Alabama rig, allowing it to sink sufficiently deep to get to the 15- to 20-foot level. The pair’s go-to bait was the Yum Flash Mob Jr. with 6th Sense Divine jigheads with 6th Sense swimbaits in a natural shad hue. Despite a spun hub on their bass boat which disabled their vessel from 1:30 p.m. on, the team had already caught enough fish to secure second place. They made a conscious effort not to let the mechanical problems plague them into the second day. Garland and Grimm spent the entire day on Stillhouse fishing deep hydrilla in 16 to 25 feet of water with the same Alabama rig and a 6th Sense Cloud 9 crankbait. Grimm, a teacher and coach at Hubbard ISD, and Garland, an electrical engineer, were presented with a $10,000 check for their efforts. On Jan. 27, while the TuffMan tournament anglers competed on Belton Lake, the top 12 teams in the Central Texas High School Tournament Trail standings competed on Stillhouse Hollow Reservoir. Each of the two-angler teams was accompanied by an adult boat captain, a volunteer responsible for the safe operation of the team’s bass boat. Thanks to a slightly lower surface temperature on Stillhouse, the lake was beset by a heavy fog which lasted into the late morning. Many teams were not able to safely navigate to the areas they desired to fish, and, once the fog lifted, found themselves with limited time to play catch-up. The late start really took its toll as none of the 12 teams brought a full five-fish limit to the scales; and five of the teams did not weigh in a single fish. When the weigh-in was complete, the team of Drew Hargrove and Kolten Mueller of Moody High School took first place with four fish weighing 8.55 pounds. A bit closer to home, the team of Tara Reid (Belton High School) and Cameron Clouse (Granger High School) represented the All Around Anglers fishing club and took second place with two fish weighing 7.51 pounds, including the biggest fish of the day, a 6.01-pound specimen. Reid and Clouse took turns working the trolling motor. Whichever worked the motor threw a fast-moving crankbait while the angler in the back of the boat worked a jig more slowly. The 6.01-pounder took a crankbait. Reid stated that despite the fog and slow fishing, she enjoyed the day on the water with Clouse and with Robert Bingle, the team’s boat captain. Reid, who plans on becoming a game warden after graduating from Tarleton State or Texas A&M, hoped the high finish would help enhance her new club’s reputation. Clouse, who also plans to attend Tarleton or Texas A&M, plans to fish with Reid as his partner though college as he pursues a career in welding. The All Around Anglers, which currently has eight members, meet on the first Wednesday of each month at the Academy Volunteer Fire Department.